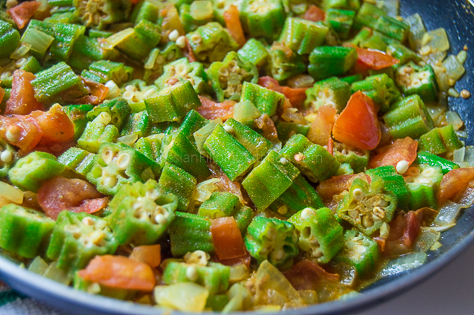 Okra and tomatoes are powerhouse foods that, when consumed on a regular basis, are beneficial to your overall health. 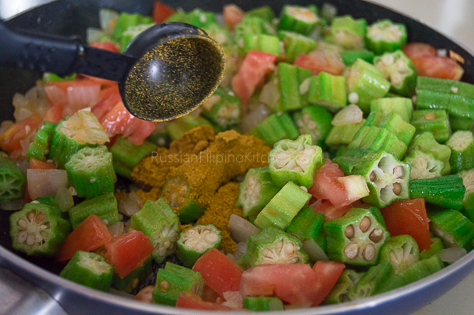 Check nutrition information for okra here and for tomatoes here. When I was growing up, my family’s diet consisted mostly of fruits and vegetables grown in our backyard. I remembered my parents growing coconuts, bananas, papayas, malunggay (moringa), lemongrass, tomatoes, hot chilis, eggplants, cucumbers, and okra. Some of our neighbors also grew fruits and vegetables and we shared harvest when possible. Being in that kind of environment, I came to love fruits and vegetables naturally and so are the rest of my siblings. 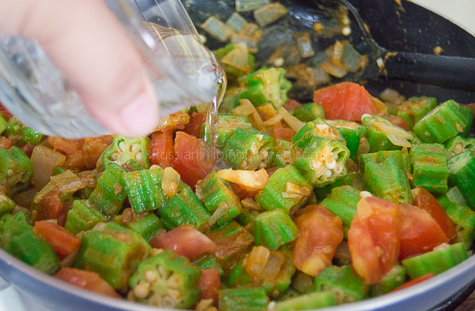 Mention “okra” and my mouth salivates as I remember my favorite Filipino dishes like “pinakbet“, “law-uy“, “sinigang” and those freshly steamed okra pods dipped in soy sauce-vinegar with crushed hot peppers! So good! 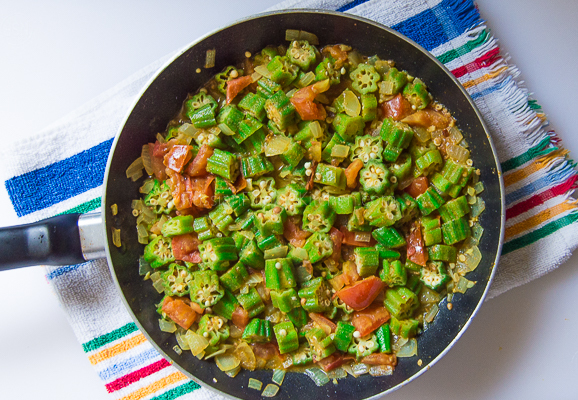 This curried okra and tomato recipe is one of those that I discovered by accident and which I instantly love and became a regular in our family menu. Ever since I discovered a few years ago that curry powder gives an extra boost of flavor to chicken simmered in coconut milk, I started incorporating them more into my cooking. This is one of those recipes that I’m proud to share because not only it is super easy to make, it is equally delicious! 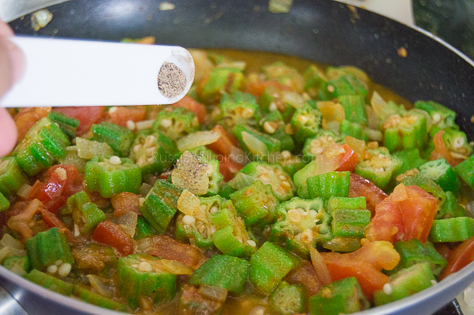 There is a pleasant blending of flavors in the dish that okra lovers will surely like. Add a pinch of chili flakes or ground cayenne pepper for a little kick, and you’ll have a perfect side dish to enjoy! 1. 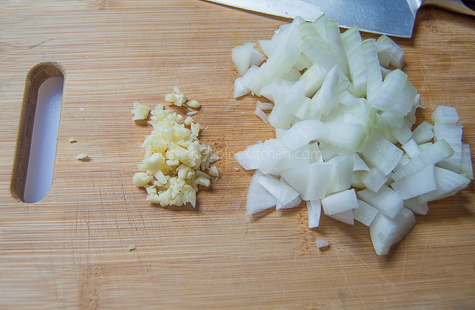 Peel and dice onions, then peel and mince garlic, too. Set aside. 2. Trim both ends of okra pods and cut into 1/2 inch lengths. 3. Chop tomato into 1/2 inch chunks. 4. Heat skillet on medium high. Add oil and saute onions and garlic till fragrant, about 2 minutes. 5. 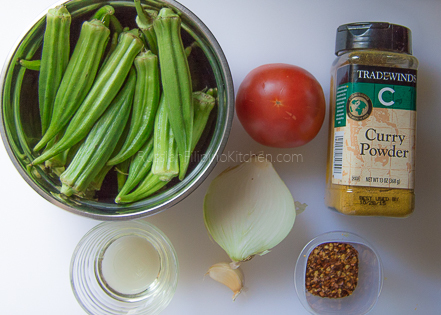 Throw in chopped tomatoes and okra and saute until slightly limp, about 2 minutes. 6. Add curry powder, water, salt, ground black pepper, and a pinch of red pepper flakes or ground cayenne pepper. Mix with a spoon. 7. 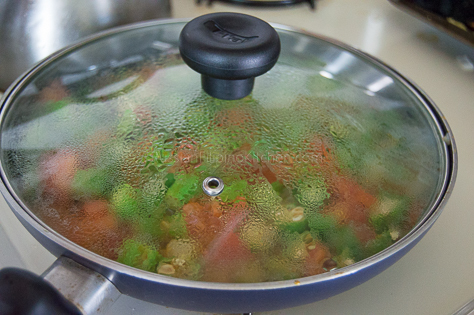 Cover skillet and simmer on medium low heat for 15 minutes or until okra are tender. 8. Remove from heat and serve immediately. Peel and dice onions, then peel and mince garlic, too. Set aside. 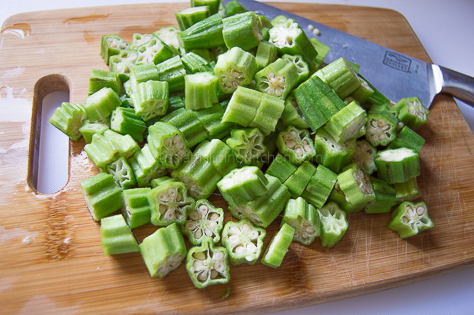 Trim both ends of okra pods and cut into ½ inch lengths. 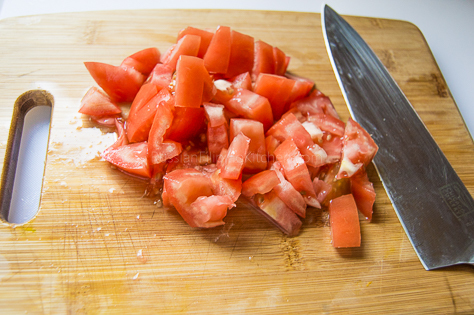 Chop tomato into ½ inch chunks. Heat skillet on medium high. 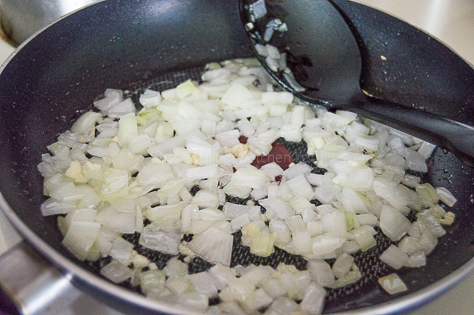 Add oil and saute onions and garlic till fragrant, about 2 minutes. 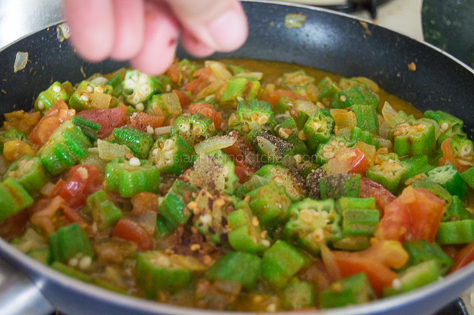 Throw in chopped tomatoes and okra and saute until slightly limp, about 2 minutes. Add curry powder, water, salt, ground black pepper, and a pinch of red pepper flakes or ground cayenne pepper. Mix with a spoon. 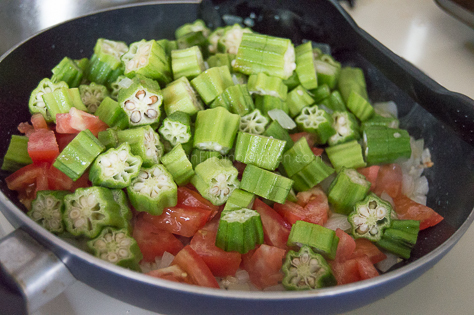 Cover skillet and simmer on medium low heat for 15 minutes or until okra are tender. I love this recipe and will try it very soon. Please keep the recipes coming. 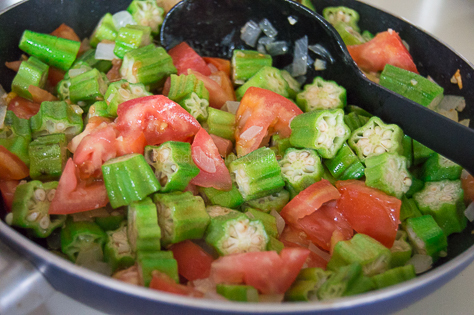 This okra and tomato dish looks healthy and delicious. Thank you for sharing!